Please scroll past upcoming meeting notices for wrap ups of past meetings. The Florida Sunshine Cookie Cutter Collectors will hold their next meeting on March 9 at Janet Ireland's home in Windermere, FL. The theme will be Gingerbread Houses. The next meeting of the RMCU will be March 30 at the Crossroads Church, 10451 Huron St in Northglenn, CO for "A Tale of Trolls, Gnomes & Fairies." Meeting cost is $15.00. Please contact Kristi Gardner by March 15 for more information. 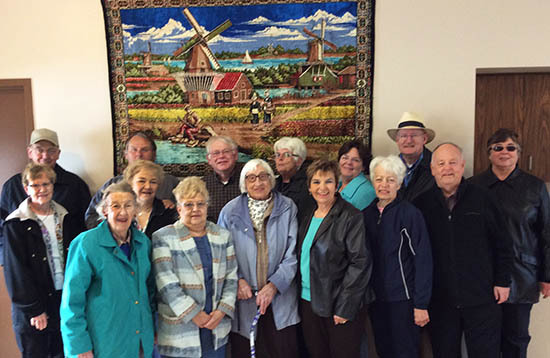 Heart of America will hold its spring meeting at Jeff & Betty Goris' home in Licking, MO on April 5-6. The theme is "Trees of the Ozarks." Meeting fee is $15 per person. Please contact Jeff or Betty by March 23 at treatycreek@hotmail.com. Big Rivers will hold their next meeting on Saturday, April 27 at the Kimberly Municipal Center, 515 W. Kimberly Ave., Kimberly, WI. The theme is "All My Favorite Things." For additional details please email Donna Nemecek at dmncake@aol.com. Twenty members and friends met at the Englewood library for the Rocky Mountain CutUps Fall Meeting. The theme for the meeting was “Send In The Clowns”. Some members met for breakfast at a nearby restaurant since the library didn’t open till 10am. After the usual meet & greet and scramble, meeting hostess Arlene Lipman gave a short program about the history of clowns and shared her collection of clowns. The meeting cutters were two different clowns that she had ordered. Elenna Firme also gave each attendee a cute jumping gingerbread boy. We had “show and tell” where one of the highlights was a Raggedy Ann Doll that Jeanne keeps her collection of cookie cutter pins on. After our brown bag lunch we had a mini-work session making table favors for our upcoming convention. The meeting ended with our raffle. The Florida Sunshine Collectors had a fun meeting in Windemeere, FL on July 11, 2015 with a circus theme. Big Rivers Meeting on April 24, 2015. 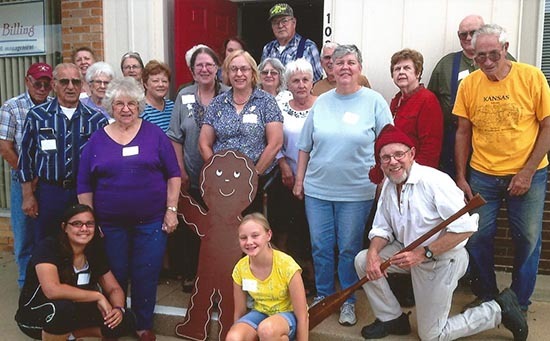 The Big Rivers Cookie Cutter Collector's Club, hosted by Donna Nemecek, met Saturday, April 24. The previous evening the group enjoyed dinner at 'The Main Event' and everyone found a beautifully decorated wooden shoe cookie at their place. '"Spring" into Dutch treats', was held at the Little Chute, Wisconsin convention center where we toured an authentic Dutch windmill that had been built in Holland. There were beautiful decorated cookie and windmill centerpieces at every table. Everyone was given a windmill cutter and wooden shoe cutter by ASM. Donna demonstrated a way to make treats for the birds by mixing bird seed with a gelatin solution and cutting it with cookie cutters after it hardens. We enjoyed learning tips for arranging fresh tulips (did you know they continue to grow after they are cut?). Carolyn Dupuis brought her speculas boards from Holland and shared stories of the tradition of the Abraham and Sarah speculas given on the event of a 50th birthday. Ella Mae Bard gave an update on the Cookie Cutter Museum and on work being done on two donated cutter collections. She brought some of the excess cutters to sell at the scramble, with proceeds going to the museum. We shared our many cutter finds throughout the day. Gary Oldenburgh had several purchased in Germany including Birkman stainless steel devil and a set of a map of Germany including cutters for each of the provinces and city-states. Leah Day showed some thimble-like devices to put on your fingers and use to make impressions in dough. Ella Mae Bard had mustache cookie kit including frosting, cookie mix, and three mustache cutters. Joyce Rapp showed a large, detailed metal snowman and gingerbread boy from Williams Sonoma. There were many other finds as well. What a wonderful time we had at our first meeting of the Southern Belle’s Cookie Cutter Club (the name agreed to by the group) at North Myrtle Beach, SC!!! Bonnie and John Price graciously provided us with luxurious ocean view accommodations. Jim Hardman led the business meeting and Trina gave a presentation and folder on how to make displays and give talks to various groups about our hobby of collecting cookie cutters. We had the traditional Show & Tell. Our North Myrtle Beach meeting was quite an international affair with 2 new members originally from Columbia living in the Charlotte area. Also attending her very first Cutter meeting was Paulette Giesbertz from Spartanburg, SC and her husband, Lothar, originally from Germany, and their 10 year old daughter Nicole. Lothar regaled us with many tales of Paulette’s search for cutters. We have named her “I Got That” Paulette as she is quite the collector. The meeting was attended by eleven people. We had a great time telling old and new stories of our collecting experiences. There was a lot learned and a whole lot of laughing. The meeting experience was enjoyed by all. 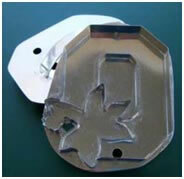 The Southern Belle’s are looking forward to being a long time part of the National Cookie Cutter Collectors Club. RMCU members met at the Englewood Library on Saturday, October 11. 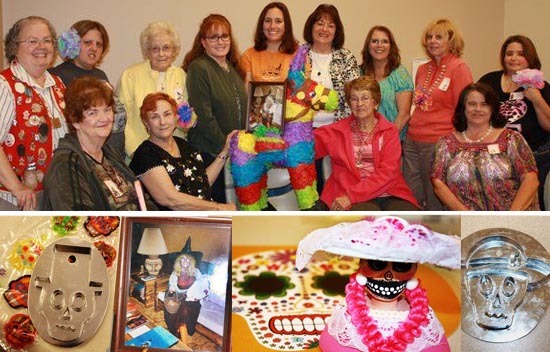 The theme for the meeting was Día de Muertos, the Mexican Day of the Dead. The hostesses, Bert Zatorski and Sylvia Sydow shared info about the holiday including souvenirs that that had brought back from their trips to Mexico. Each attendee received a special cutter made by our own tinsmith, Elenna Firme. Connie Stejelis won the prize for the "best decorated cookie" following the theme of the meeting. We had our usual cookie cutter scramble and raffle with lots of baskets donated by the daughters of our former President, June Sturm-Roller. We have renamed our raffle "June's Raffle" in honor of all she did over the years both for RMCU and the CCCC. Members brought Mexican Themed cookies to share. We enjoyed our "brown bag lunch" and show and tell. We also spent time planning for our 2016 CCCC convention in Denver. Heart of America began a fantastic Feast of the Hunters Moon celebration Friday afternoon, September 26, in Ellinwood, Kansas. Attendees could tour the Ellinwood Underground and/or the Kansas Wetlands Center or nearby Ft. Larned and take a bus tour of the Cheyenne Bottoms...the first evening they received a quill pen pin made by Jeff Goris A sloppy joe supper with salads was followed by a scramble, show and tell, and a history of meetings and cookie cutter capers. The popular Country Eggs breakfast casserole began the day on Saturday. . . Jeff Goris, dressed as a voyageur, gave the theme program about the long popular Feast at Ft, Quitennon in Indiana. Members got to see and feel a beaver pelt, Harpers Ferry Rifle and pistol, trade silver, and other items a voyageur might have. . Each received a rifle shaped cookie cutter from ASM and a beaver cutter pin by Treaty Creek. 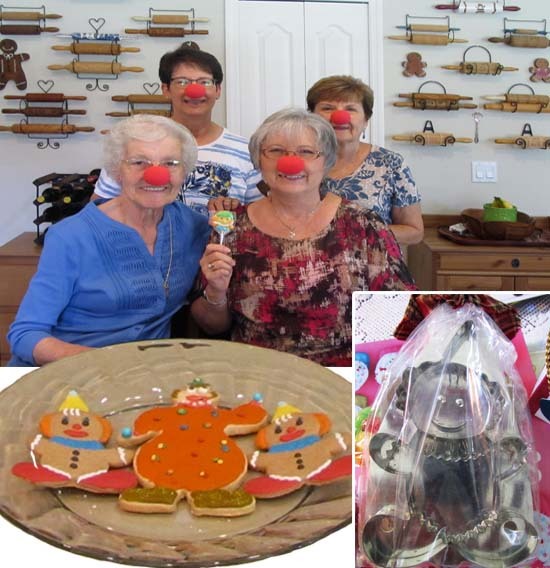 Dee Jordening shared her large collection of wooden biscuit cutters and a Foley kitchenware 1950 cookbook which she distributed. They all received a maple leaf cutter from ASM. The next program was about a water bird in the north country: the black and white loon. this was presented by Joyce Moorhouse with Wally Bloss providing sound effects. Loon cutters by ASM were given out. .
After a smothered pork chop and sweet potato lunch, a special presentation by Betty Goris featured the Potts Brothers of Canada. They have been in the tin business in the same location for nearly 85 years and are now retiring. A cutter especially made for the meeting by the Potts Brothers and a booklet telling of the company’s history with wholesale advertising sheets was given. At various times during the meeting. Ray Perry shared various cutters with interesting information he found about them. A brief business meeting was held. Leecia and Wally Bloss of Joplin will host the fall 2015 HOA meeting. Leecia gave bird feeder treats shaped by a bird cookie cutter to each member. Some of the meeting prize winners were: Joyce Moorhouse a large squirrel cutter provided by Karen Hurd, Patty Johnston , a cottonwood leaf cutter by Bill Metz; Kay Johnson, a pear butter by P.W. Blum III; Dee Jordening a maple leaf cutter by Paul Laframboise; Patty Johnston, mini heart and star cutters by Larry West; Diane Davis a cottage cookie jar ; Kay Johnson, a 3-D replicator floral cutters Willie Ensz, a ceramic canoe cookie jar paddled by a moose and a bear donated by Pam Nelson; Joyce Moorhouse a caoe cutter with two voyageurs by Treaty Creek; Rosemary Cromer, a basket of Pillsbury goodies and cutters. 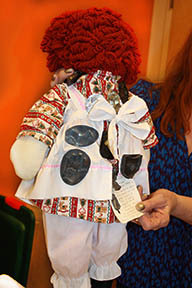 Jenny Perry received the handmade Indian doll with a cutter made by Charlene Achatz. Joyce Moorhouse provided theme decorated sacks to hold all the cutters, pins and prizes everyone received during the day. Supper was at Playa Azul in Great Bend with one more surprise gift. The ladies received a piece of jewelry made by Tinsmith Larry West. The spring HOA meeting will be held in Manhattan, Kansas, April 17, 18, 2015, hosted by Joe and Pat Johnston. “Scarlet and Gray” reined for the day at Sugarcreek collector gathering in Ohio September 20, 2014, hosted by the east Ohio Tusky Dough Girls. The 35 collectors and guests who traveled from MI, PA, NY, VA, and KY to the Amish/ Mennonite area were patient with the Ohio State theme. --Lori King reported on the Buckeye Tree, the state tree and basis for the nickname as “buckeyes.” Hetuck is traced to the Indian description of the dark brown nut as the eye of the buck (deer). While the nut is poisonous, the confection version with creamy peanut butter center dipped in chocolate leaving a portion exposed is popular among OSU fans and anyone who likes the favor combo. For this gathering the Goodie bag included a buckeye cookie cutter (a tin outline cutter and a peanut roll out cookie recipe, frosted with melted sweet chocolate) a gift from The Little Fox Factory (Mary Fox and Kevin Kohls). -- Brutus Buckeye, the mascot of The Ohio State University Buckeyes made a special appearance, with Jan Johnson relating the history of Brutus born in 1965. 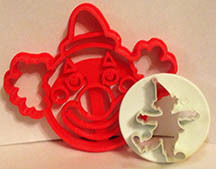 He is also the model for a cookie cutter favor (outline tin cutter made by Little Fox Factory) for this the event. -- Buckeye sports include much more than the nationally reported football team. Athletics offer competitive teams, recreation and exercise for students, staff and faculty. There are 39 varsity teams in a wide range of sports for men and women at main campus and branches of OSU. -- Cutter Scramble and Show and Tell are always popular among collectors and included many new finds of Rosemary Henry. -- “Down Memory Lane” – Ruth Capper challenged participants to recall their first CCCC function as she shared highlights of parties and conventions from 1970s to present. On a beautiful fall day there was time for collectors to enjoy some of the popular local options of Amish area such as the Alpine Hills Museum, various shops and a drive through a covered bridge. There are quite a few regional clubs. Some are more active than others, but usually anyone is welcome, whether you are a member of that particular group or just visiting the area. Check with each individual club below for more information. Capital Chapter (includes District of Columbia, Maryland, and Virginia.